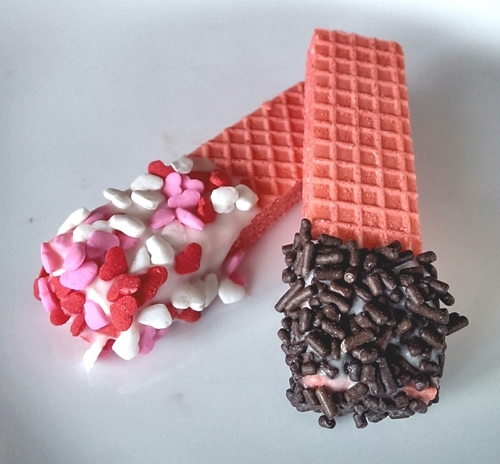 These Easy Valentine Cookie Wafers are easy to make with kids. They require no baking. The wafers are a colorful, quick treat to make for a school party or to pack in lunch boxes. And they’re fun! Start with pre-packaged wafers, which are available at groceries and food stores. They are made with ultra-thin cookie layers, often pressed with waffle surface pattern, with crème filling sandwiched in between layers. Cookie wafers are available in various colors and flavors. Dip them into melting candy and rolled in Valentine decorations or colored sugar. They harden quickly. Pour cookie decorations into shallow bowls. Set 4-8 ounces of melting chocolate in a microwave-safe medium bowl. Heat the chocolate in the microwave according to package directions. Stir melting chocolate at regular intervals until it is smooth. Gently grasp a wafer at one end. Dip about one-quarter to one-third of the wafer into the melted chocolate. Swirl the wafer so that its lower end is completely covered. Gently shake off the excess chocolate. Dip the chocolate-covered end of the wafer into the cookie decorations. Coat completely. Set decorated wafer onto the waxed paper-covered baking sheet. Repeat the process with each wafer until all are covered with chocolate and decorations. Set baking trays in refrigerator so chocolate can cool and set. Store in an airtight container with waxed paper in between layers. These Easy Valentine Cookie wafers can be rolled in decorations or colored sugar appropriate for any holiday or season, but red, pink, and white decorations make the cookies a fun and easy Valentine’s Day treat.